Easy Graham Cracker Toffee-you only need 5 ingredients to make this delicious and addicting toffee! It is the perfect treat for the holiday season. I go cookie crazy every December, but I also like to make other treats, like this Easy Graham Cracker Toffee. It is one of our family’s favorite recipes. I’ve been making this recipe since I was a little kid. Well, I helped a little and ate A LOT:) It tastes just like homemade toffee, but it is SO much easier. 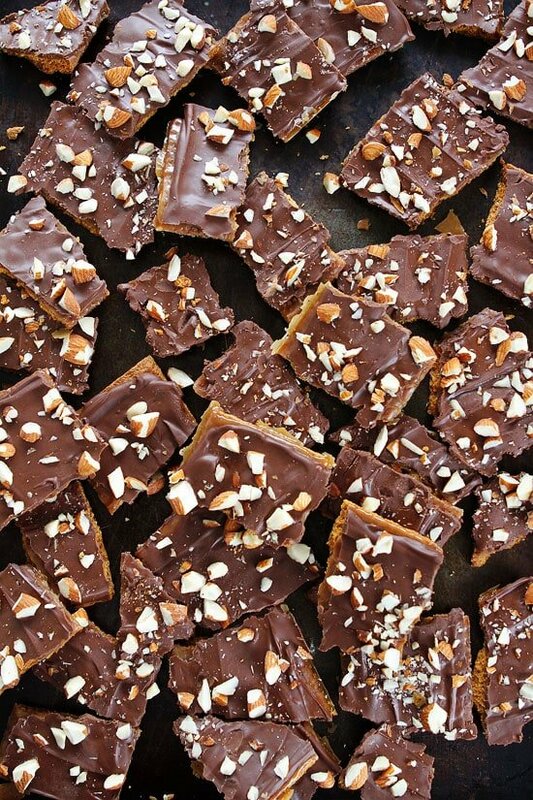 You can whip up this tasty toffee in no time, which makes it the perfect treat for the holidays. It is a stress-free treat and everyone LOVES it! 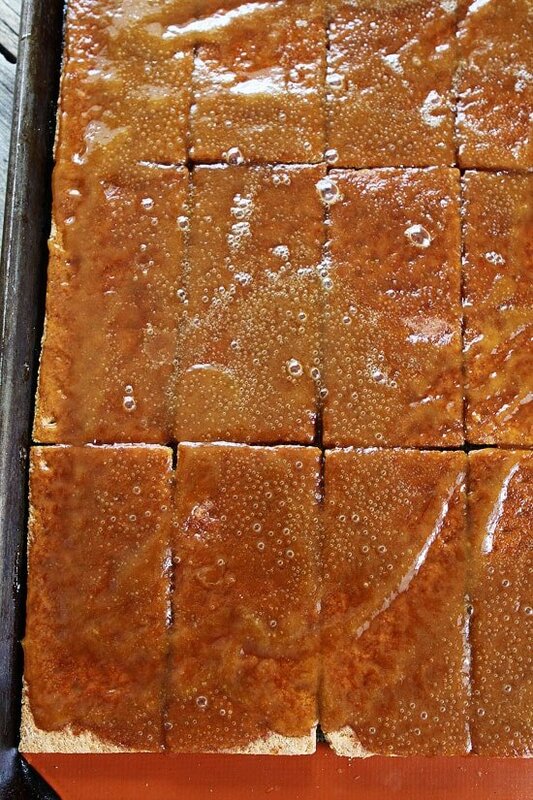 I love this toffee because is a no fail recipe. It comes out perfect every single time. 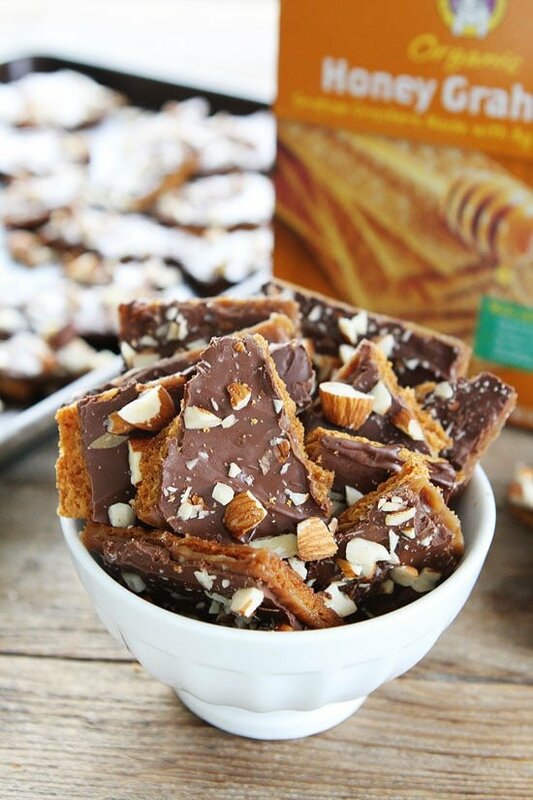 You only need five ingredients to make the toffee: graham crackers, butter, brown sugar, chocolate chips, and almonds. 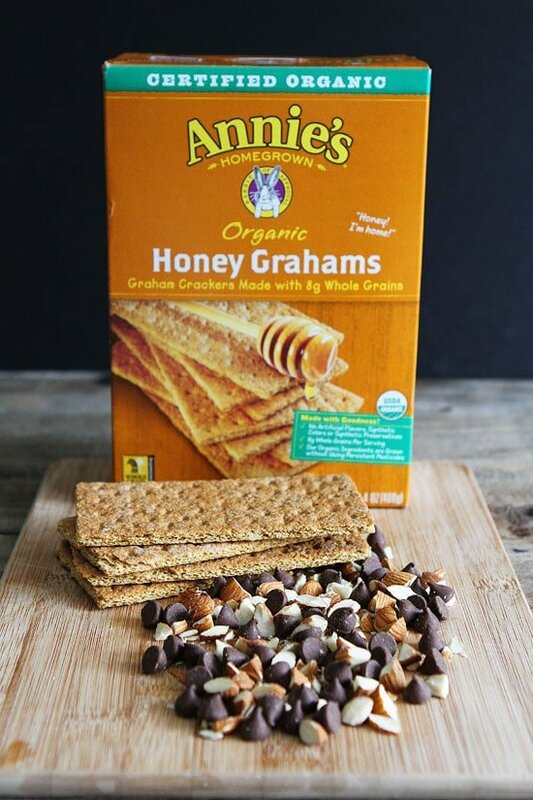 We like to use Annie’s Honey Grahams, they are our favorite! First, line a large baking sheet with a Silpat baking mat (parchment paper or foil will work too). Add a layer of graham crackers. In a saucepan on the stove, boil the butter and brown sugar together. Pour the hot mixture over the graham crackers. Bake in the oven for 8 minutes. Remove from the oven and sprinkle with chocolate chips. Let the chips sit for about two minutes or until they start to melt. Use a spatula to spread the melted chocolate evenly over the grahams. Sprinkle with chopped almonds. If you prefer pecans, go ahead and use them, both are tasty! When the toffee is set up, break it into pieces and enjoy! 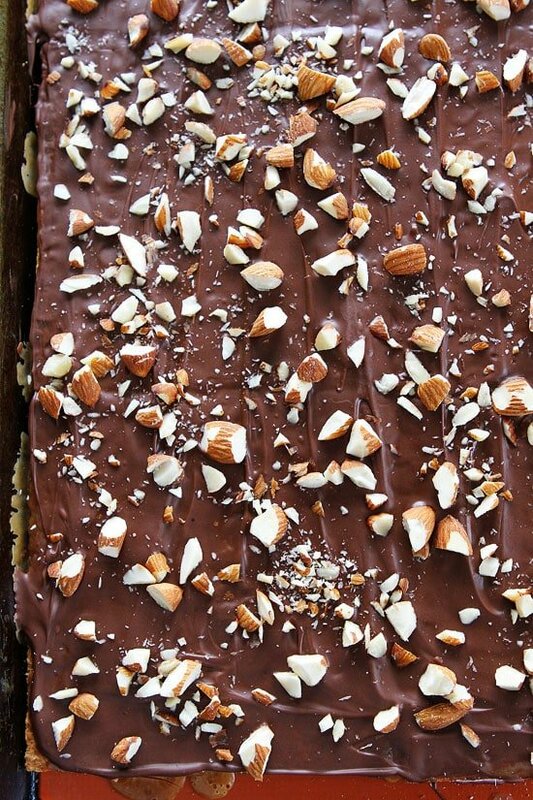 The recipe makes a huge pan of toffee which is a good thing because it is ADDICTING! Once I start eating, I can’t stop. I usually make two pans, one for us and one to share with family and friends. You can put the toffee in a festive tin or box and give it to your neighbors, co-workers, teachers, friends, and family for Christmas. It is also a great treat to serve at holiday parties or just keep some on hand for when guests drop by! This Easy Graham Cracker Toffee is one of our favorite holiday treats and we hope you like it too! 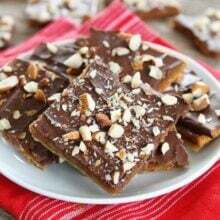 And make sure you try our Saltine Cracker Toffee too! The saltines add a nice saltiness that you won’t be able to resist! 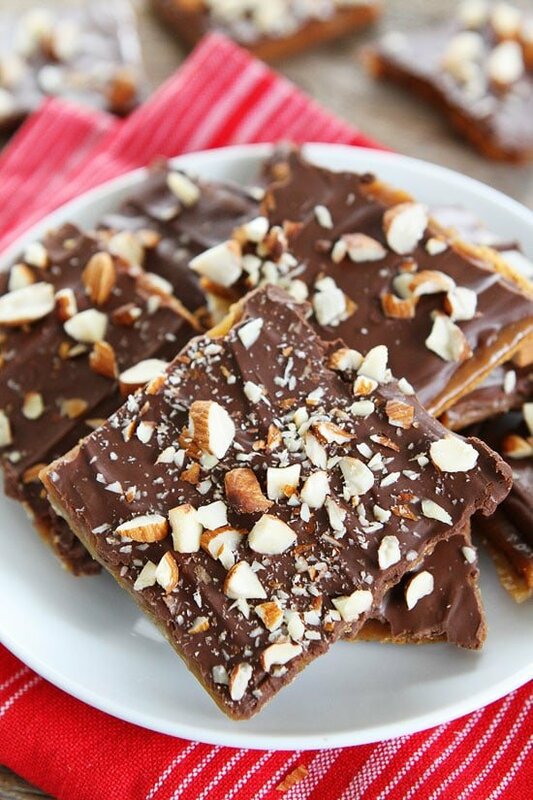 You only need 5 ingredients to make this delicious toffee! It makes a great gift during the holiday season! Preheat oven to 350 degrees F. Line a large baking sheet with a Silpat baking mat, parchment paper, or aluminum foil. If you are using aluminum foil, spray lightly with nonstick cooking spray. 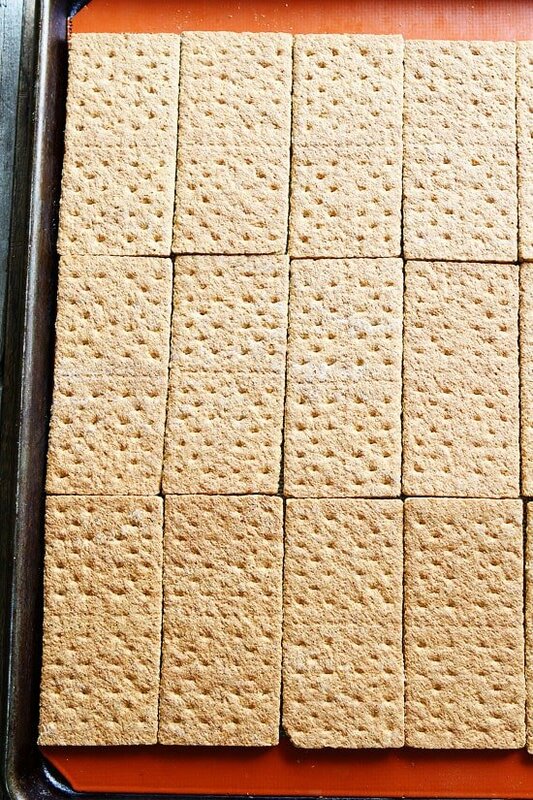 Place graham crackers in a single layer, touching, on the large baking sheet. Set aside. In a medium saucepan, melt butter and brown sugar together over medium-high heat. Bring butter and brown sugar mixture to a boil. Simmer for 4 minutes, stirring constantly. Pour mixture evenly over graham crackers. Bake for 8 minutes. 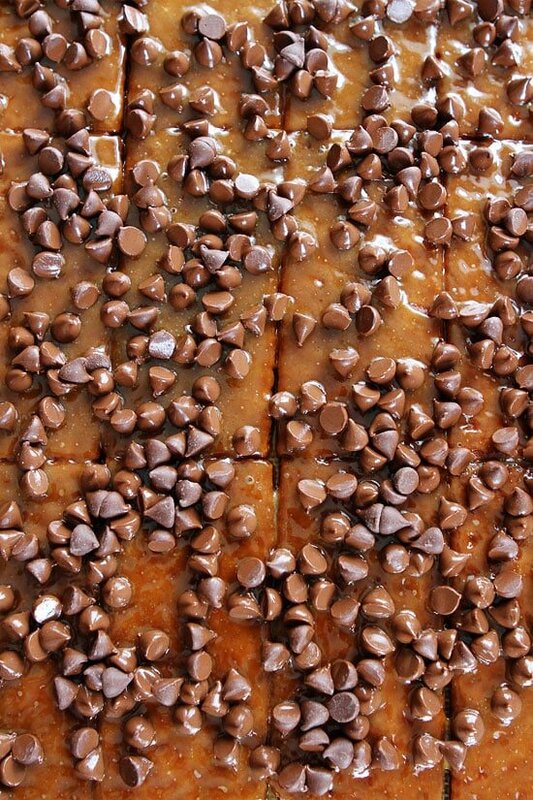 Remove the pan from the oven and immediately sprinkle chocolate chips evenly over the top of the graham crackers. Let the chocolate chips sit for 2 minutes so they have a chance to melt. Spread melted chocolate with a knife or rubber spatula. Sprinkle almonds or pecans on top. Let the graham cracker toffee sit for about 2 hours or until the chocolate hardens. 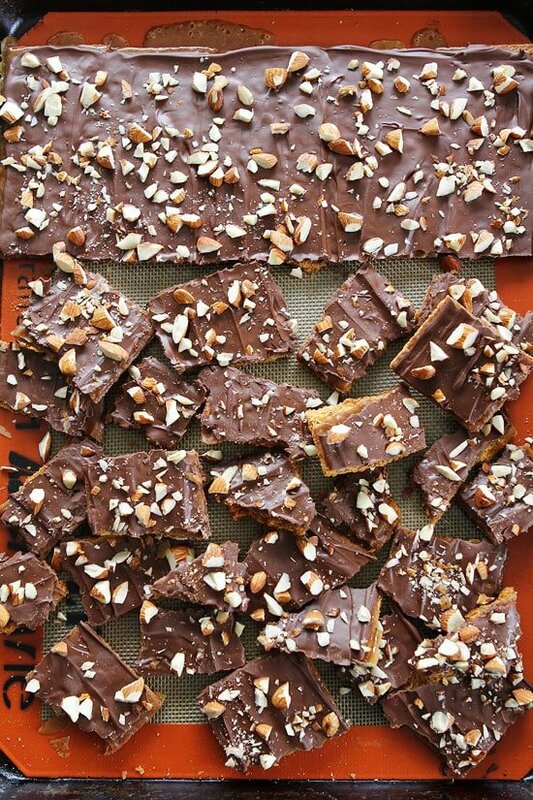 If you are in a hurry, you can refrigerate the toffee for an hour, or freeze for 30 minutes. When chocolate is set up, break the toffee into pieces and enjoy! Disclosure-this post is in partnership with Annie’s, but our opinions are our own. Thank you for supporting the brands that continue to make Two Peas and Their Pod possible. ow! I’ve made the saltine version, but never thought to use graham crackers! What a fun take on an old favorite! Love that you used Annie’s too! Yum! This look so good, will be my Christmas gift this year. OH MY GOODNESS, this looks amazing! I love the graham cracker take on it. You just made a holiday favorite EVEN BETTER! 🙂 You go girl. It is sooooo good! I hope you like it! 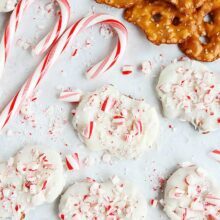 Love this fun Holiday style treat!! Love this idea! I would not be able to stop munching on these!! I have a love hate relationship with toffee. Love because it’s the best stuff on earth. Hate because every time I make it I find myself eating over half the pan. Easy and delicious! Sounds like a winner to me! I’m sold on anything with toffee. I love how simple this is. Oh I would love these! yummy!! Um, five ingredients? Yes please! Nicely done with the step-by-step pictures! I know that’s not usually your thing so it was fun to see this time. And this looks much more to my taste than the saltine one people usually make. Thanks! I wanted to show how easy it really is! I want to make this for my coworkers this year! Do you use salted almonds or raw? I use salted because I like the salty kick, but either will work! Enjoy! OMG! these look incredible. I might have to see if I can do this dairy free- it looks so good!! So delicious! This is my go to cookie tray desert! 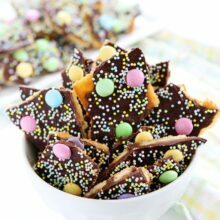 I’ve tried making this but find the sugar and butter mixture doesn’t get under the crackers so i end up with a layer of cracker, layer of toffee and a layer of chocolate. It’s still delicious but it doesn’t look as good. Any ideas why the toffee mixture doesn’t sink the the bottom? Thanks! That happen to me too. Such a creative way to make toffee! Toffee season!! My freezer never looked so happy. And I never had to test my control so much! Do you use semisweet chocolate chips or milk chocolate chips? Thanks, can’t wait to try! I have used both. Use your favorite kind of chocolate! Enjoy! Loved this recipe, giving it to some family members to enjoy. The buttery flavor is delicious. 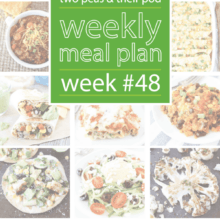 A very easy and creative recipe! My chocolate would not harden even after several hours at room temp so had no choice but to put it in the refrigerator, but other than that, something we will make again and again! Yum! This is an annual favorite. Economical as well and easy. Around here we call it “Christmas Crack”! In part because you “crack” it and because it’s addictive. Can’t imagine not enjoying it! I’ve been making and selling a version of this since 2009 called Sugah Bark. This is what I do differently: 1/4 cup each brown sugar and white sugar. Bake at 375 for 10-11 mins. I top mine with Merckens or Peters candy coating in whatever flavor chocolate – or even peanut butter coating and various toppings. Chill in the fridge for 2 hours then break into pieces. Stores great in the fridge or freezer as well as room temp. 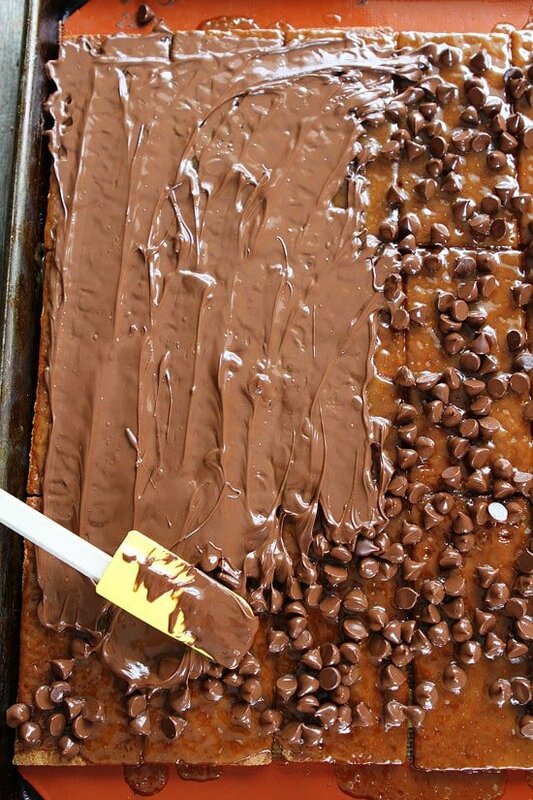 Oh…you don’t need to use a silpat if you give your baking pan a good spray with Pam or something else. Try these flavor ideas or come up with your own: white butterfinger, dark sea salt toffee, milk oreo…peanut butter with chocolate drizzle and chopped peanuts. The versions are endless. Soooo easy, my 5 year old loved helping make this! & instead of nuts on top, we crushed up some pretzels. A new family favorite added to our holiday traditions! Thanks!! Oh.my. This is incredibly addictive!! Super easy to make too. I had to get it out of my house so I took some to work. People are mad at me because they can’t stop eating it either!!! Thanks for another great recipe, Maria! Love this thought! I would not have the capacity to quit chomping on these!! Pleasantly finished with the regulated pictures! I realize that is not more often than not your thing so it was amusing to see this time. What’s more, this looks a great deal more to my taste than the saltine one individuals generally make. I have an affection loathe association with toffee. Love since it’s the best stuff on earth. Abhor in light of the fact that each time I make it I wind up eating over a large portion of the container. This so sweet two pea sand their pod. so I love that all types of peas…………!!!!!!!!!!! I have made and sold a version of this for many years. I use the Bisco honey grahams because they are less expensive and work very well. I use quarter cup white and quarter cup brown sugar for one cup of unsalted butter, and bake for 10 minutes at 375. Instead of chocolate chips I strongly recommend candy coating is such as merckens, or even Wilton. The Number of flavor variations is staggering. 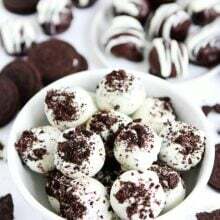 My best sellers included milk chocolate with crushed Oreos on the top and a white chocolate drizzle, dark chocolate with toffee and sea salt, as well as white chocolate with cranberries and pistachios and day dark chocolate drizzle. It is a great recipe to have fun with,. I think I will try the gram cracker toffee! Let you know when I do!Sounds so good! I’ve made this recipe many times and it’s always a hit! I didn’t have enough honey graham crackers left but I had a full box of cinnamon grahams. I used them for approx. 3/4 of the recipe and they were awesome everyone, including teens, loved them. We have a big New Year’s Eve Party coming up…this will be perfect! Hmmm, I have never had a problem and I always bake it. You need to so the sugary mixture will set up on the crackers. Did you boil it long enough? I just came across your comment and the first problem I saw, was that you used Wax Paper. Don’t do that. You should have used Parchment Paper. And it never hurts to give it a quick spray over with a non-stick spray, such as Pam, or any store brand would work too. Second, don’t fret about any of the syrup going underneath the graham crackers. Third, if you have this problem, which you shouldn’t, you can freeze these then take them off the paper while frozen. They should release much easier. Hope these ideas help you out. Oh, and make sure you bake these. It’ll help with everything you need to accomplish. Take care and happy baking. Hope this works great for you this year as Christmas 2017 is just a few weeks away. I made these, but these seemed a bit soggy and not crispy enough? I have been searching for this recipe for four years. I tasted these at a party, didn’t know who made them. I fell in love with it. Thank you, thank you so much for sharing this recipe! These looks awesome!! Wondering…. Thinking about giving for gift, how long will these stay good? You can keep in an airtight container for up to a week on the counter. You can even freeze the toffee for up to 1 month. Have made and sold a version of this for years, under the brand name Sugah Bark. I do it a little differently – I use a 50/50 white sugar and brown sugar combo. For toppings, I use about 11 oz of Merckens Candy Coating (any flavor you can think of), or even Wilton Melts will do. Then top it with a wide variety of options. White coating w/butterfingers and dark drizzle; milk coating w/crushed oreos and white drizzle; dark w/sliced toasted almonds, cacao nibs and smoked sea salt; Mint coating w/crushed peppermint and white drizzle (or dark); Dark coating w/chopped Reese’s and chopped honey roasted peanuts…you get the idea. Go crazy!!! It is a fun recipe! I’ve tried making a really similar recipe (not yours, though), and while it tasted delicious, the toffee and the chocolate layer completely separated from the graham crackers. I still don’t know why. Any ideas? I’m wondering if I should’ve cut the dessert when it was warm, rather than chilled, to keep this from happening. Made this for Christmas & everyone loved it. They were perfect. Next two times I made it the chocolate separated from the toffee. Help! What did I do wrong? Oh my goodness! These are delicious! I am not supposed to eat chocolate, so I used unsweetened carob chip. They don’t melt so good, but they are yummy just the same. So decadent! Do you just take it out to thaw? Do the graham crackers stay crunchy? Wow these are so yummy!! I made them tonight and drizzled a little bit of white chocolate on top. My only question is how long will they keep and how should I store them? Thanks for all the great recipes! I’ll me making a ton of your things in the next few weeks and. I like to store in a container in the fridge to make sure the chocolate doesn’t get melty. You can store on the counter, just keep in a cooler part of the house, not by a heat vent or super warm kitchen. I just made the Easy Graham Cracker Toffee and am very disappointed in the results. I think boiling the sugar and butter mixture for 4 minutes is too long. It just didn’t look right when I poured it on top of the crackers and when it baked, it looked sugary crusted and seemed like the butter was separating as I could see oily droplets. I’ve sampled the toffee portion and it’s awful sugary, but hasn’t cooled completely. This was a failure and a waste of two sticks of butter and one and a half cups of chocolate chips. Not sure I would try again cooking it at 3 minutes instead of 4 minutes. Bring to a boil and then SIMMER. How long will it stay fresh in air tight containers? Why did my butter separate from the brown sugar while it was baking? I had a layer of butter on top. Still good, but I had to blot up the butter and it was rather grainy. Took these to work and everyone loved them. I prefer to follow a recipe as written but I only had milk chocolate chips on hand. They melted quickly and tasted wonderful. I thought I’d try this receipe using the Splenda brown sugar. Big Mistake! Don’t use. The butter separates from the brown sugar what a mess. Like they say, “Try, try, again’. So I did. The butter and regular brown sugar blended well. Also, I added 1/2 cup more of nuts; making sure to cover all the graham crackers. The cookie sheet is in the fridge, and can’t wait to taste! Thanks for the easy and affordable toffee receipe! I have cinnamon grahams…think it will taste okay? Yes I make it a lot for party’s and Christmas everyone loves it easy and taste awesome good to give as gifts to very Yummy making it this week for my granddaughters Graudation Party . it will be a big hit. Fabulous! I used gluten free graham crackers because I have a wheat allergy, and they turn out perfectly delicious! Oh, good to know! Glad you liked the recipe! Pingback: The best (and easiest!) holiday cookies for people who don't love to bake. I just wanted to say we’ve been making these for years and in my house they are known as “crack bark”. I add a few things to mine though. Depending on who I’m making it for and I have a version I taught my 10 year old niece to make since cooking the butter and sugar can be dangerous I made a cheat version for her. The cheat version for her is still to line the pan and then place the crackers but for the toffee part we get a bag of caramel bits and add 3 tbsp butter & 1/4 c heavy cream and keep heating in 30 second intervals until it’s completely melted & whisk it really well then pour it over the crackers (it should be pourable by then) I ladle it over each cracker to cover first then pour the rest. I bake it for 6-8 min watching for the thick darker look of toffee but not burnt. I add the chocolate as directed but my niece loves to add coconut and toasted peanuts to hers. Sometimes we even add marshmallows and toast them under the broiler for a minute. I also make a white chocolate version with candied ginger and candied orange peel in the white chocolate with chopped toasted macadamia nuts. You can have a lot of fun with this. Once just because I had it on hand I added to my brown sugar butter 3 tbsp of caramel apple dip and let it cook in at the end of the sugar cooking process and that ended up being such a creamer toffee I’ve almost made it routine. We even make a different cookie bottom with the Graham crackers and pretzels! We use the food processor and grind up the Graham crackers and about a cup of broken pretzels (I use the thin sticks) to a fine mix then add 1/4 c butter and 2 rounded tbsp sugar blend well and press onto a parchment lined cookie sheet all the way to the edges. Bake at 350 for 5-7 min once you see it’s pulled back a little and it doesn’t look wet it’s ready to take out. Let it cool and harden a little while until it’s just warm to the touch before you pour the toffee over it. It’s so fun to share recipes and ideas because food I think is the music of love and laughter and you can reach even the hardest of hearts with food because food contains memories and to be able to bring back a happy memory for someone with something I’ve made & to see them cry means so much to me. I have a muscular degenerative disease with connective tissue disease so I’m losing abilities in my hands and need a double knee replacement. My hands are deteriorated so I’m losing abilities so I’m cooking as much as I can showing up with plates of food for friends…some blaming me for their holiday weight already though we haven’t even got to the good stuff yet! But I just wanted to say never give up and remember you can always keep trying recipes and get comfortable playing with flavors of your own, you’ll see you are creative and baking is so much easier when your not afraid to make a mistake…just try again and you’ll find your masterpieces. Just made Toffee graham candy! After 4 hours my graham crackers were not hard at all. Just add enough crackers to fill cookie sheet end to end. Turned out horrible for me. The toffee never set! I’m guessing maybe I didn’t simmer it long enough?? My chocolate also became gritty when spread on top. I’ve made these a couple years ago with a different recipe, and they turned out great. Not sure what happened this time. Easy peasy, delicious! I add salt and used peanuts. delicious and easy. Best of both worlds! Making a second batch because I ate the first batch in 10 days myself. So addicting! I used pecans and dark chocolate chips and added about a half cup of caramel chips. Hopefully I can get it packaged in mason jars for gifts today before I start sampling. READ IF YOU’RE HAVING PROBLEMS WITH SETTING! I’ve been making these with this recipe for several years and have never had a problem (didn’t get around to them last year). It’s always turned out well and a big hit during the holidays. Until this year. I swear it’s the Graham crackers. I’ve been saying for a while now that they (Honey Maid) just don’t seem to be what they I’ve were (thinner or “airier”?). Well, I followed the directions to a T as normal. What I got out of the oven was a soupy mess & I could tell something wasn’t right. The grahams were soggy & swimming in the toffee mix. I continued on, hoping for the best. What I got next was melted chocolate mixed with gritty sugar and a chewy, gritty, sugary, graham cracker crust that didn’t set properly. I wasn’t satisfied and couldn’t share this with family! So… I made another batch, this time I didn’t use all the toffee mix. I spread an appropriate layer (enough to evenly coat and be soaked up without saturing the crackers). I even made another 1/2 sheet with what crackers I had left. I got a much better spread on my chocolate (shiny & smooth) and a crunchy cracker bottom after it set. Conclusion? Use less toffee mix. I don’t blame the recipe, it used to work perfectly! Simple ingredients and easy to make and maddeningly addictive, it’s got the perfect balance of sweet and salty! Of toffee chips instead of pecans or any nuts. It’s scrumptious. Unfortunately, I gained 5 pounds and am only going to make it during the holidays. It’s totally addictive. Hi, I was do anxious to try this because it seemed so easy. I ran into a couple of problems though. The chocolate chips wouldn’t melt and it didn’t look as if there would be enough. I added some more chocolate and then put it under the broiler. I was fearful of scorching but the chips still didn’t really want to melt. As I spread the the chips it was picking up the butter sugar mixture. Has anyone else had this problem? My toffee (butter and brown sugar) was crystallized and tasted sugary. Did I over cook or under cook it? I boiled it for 2 minutes. My toffee didn’t harden, I’m not sure why?